This crooked little building, which might appear rather unimpressive at first view, is a real Hamburg original. Canteens with affordable meals for the harbor workers used to be very common in this area, but nowadays the Oberhafenkantine is the only one which is still working. Built in the 1920s, the restaurant survived several storm floods, which finally led to the crooked position of the little house. But this only adds up to the incredible charm of this place in this rather industrial harbor area- and even nowadays you can enjoy the restaurant just like it used to look like decades ago. However, the food is definitely more than only a simple on-the-go-meal! 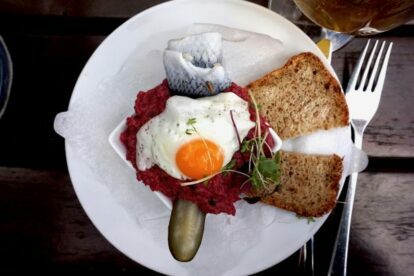 Try their delicious labskaus, fancy burgers or typical Hamburger deserts like ‘Rote Grütze’, a type of jelly made of red fruits served with vanilla sauce. If you’d like to enjoy an important part of the old Hamburg harbor traditions, this is the perfect place for you – just take care you don’t get a little seasick walking on the uneven floor!